Earlier this week, Scott Powers of The Athletic reported that the Blackhawks have had trade discussions with Carolina surrounding defenseman Justin Faulk and former Hawks netminder Scott Darling. On Tuesday, Mark Lazerus of the Chicago Sun-Times reported that Carolina has their eyes set on Brandon Saad. How would all of the money work? Faulk has two years left on his current contract and carries a cap hit of $4.83M. Darling has three years left on his current contract with a $4.15M cap hit. Saad has three years left on his current contract that carries a $6M cap hit. Hossa is the intriguing name in this mix. He has three more years left on his contract that has a $5.275M cap hit, but the actual payout on his deal is only $1M per season and he will spend the final three years of his contract going on LTIR. No concrete proposals have been reported, but enough has been written by reputable sources that there has to be more than smoke here. Would the Hawks move Saad one year after bringing him back? And what would be the dominoes that followed a potential acquisition of Faulk with the Blackhawks having a crowded blue line? After all, the Hawks just signed Henri Jokiharju, their top prospect, on Tuesday. Carolina has seven picks in the 2018 NHL Draft. They do not have selections in the third or fifth rounds, but do have two picks in the fourth and seventh. The Canes moved up from the 11th pick to the 2nd overall selection in the NHL Draft Lottery as well. Chicago has eight picks in the 2018 NHL Draft, including two first round selections (#8 and 27). Brandon Saad will be Brandon Saad again next year… so we keep him! If this transpires as set forth in the reports, in essence that is/was trading Panarin (& Hossa’s cap hit) for Faulk & Darling. In retrospect, Panarin was already signed, Darling would have been re-signed at slightly less of a cap hit than he has w/ Carolina, and the Hawks would have been a better team last season w/ Panarin & a steady, reliable back-up goalie comfortable in his settings and role. They never used most of Hossa’s cap hit monies (other than Franson) as it turned out, Darling’s cap hit would have covered it. This is subject to a lot of debate and posts if it goes thru. As Q loves to say, “we’ll see.” If it does go thru, and Q is questioned about the trade, the media can finally take the opportunity to ask him about Kempny’s time in Chicago. Maybe Q was jealous of Kempny’s hair (Vermette has nice hair as well, so does Pirri, maybe it’s a hair thing w/ Q and not performance based). Would definitely indicate they are going all in for next year and just the start if this is accurate. I’m confused; I thought Hossa was on LTIR and therefore his cap hit is like a million or something as his full cap hit doesn’t count when he’s on LTIR; or does none of it count. What am I missing here? Hossa’s cap remains at 5.275m until his contract expires in 3 years. His actual salary is only 1m a year until then but cap hit remains as calculated before regardless of his ltir status. I think that the bottom line is that the Hawks have to keep into account Hossa’s cap hit and depending on which formula they use affects how they can alleviate that hit. From the Hawks perspective, it’s better if they have him off the books entirely. For a team looking to add his cap hit to reach the cap floor, it works because his cap hit is high, which would help them hit the floor, but his actual salary is low so it doesn’t cost them a lot of real dollars. Seems like alot but if as it looks going all in then go big on ufa for forward help and even if he wanted do a 35+ deal with Hamhuis for more D help and not need much cap space for that. Saad is due for a big bounce back year. He probably led the league in goal posts last season, so this season he’s due for his luck to go in the other direction. Now if the Canes were talking about trading Hannifin? Maybe? Please no—Faulk has had trouble in the +/- area for a few years-last year was -26, and his point production has declined the last 4 years. He’s an upgrade but not for Saad. Darling was exposed last year. Great guy though. I’m with Tony. If Hanifan is part of the deal that’s a completely different story. A left-handed top 3 defenseman for years to come. I do NOT get the fascination with Faulk. I fear Stan is going to get fleeced. However, if he unloaded Saad, hopefully that would allow him to take a run at James Van Riemsdyk on July 1. Why are Chicago fans so worried about trading pick 27? They currently have one of the worst farm systems in the NHL. Wouldn’t keeping the picks and developing some young talent be wiser? 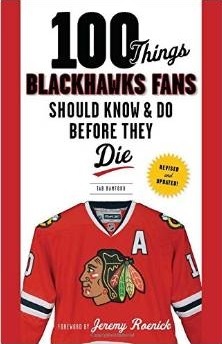 year is it really possible for Chicago to win the cup this year? 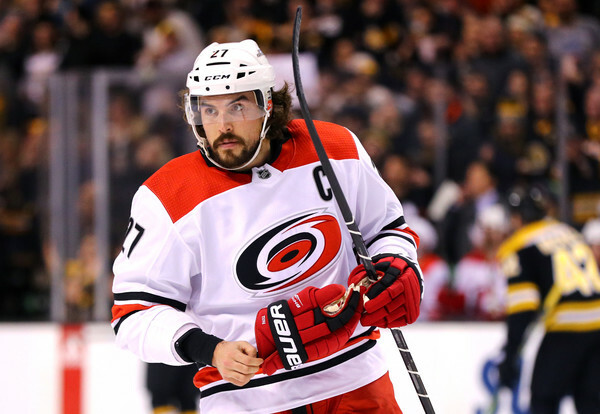 As for Justin Faulk… Is he going to put the Hawks over the top? Statistically a huge minus player. My thinking is keep the picks and accumulate even more picks so we have hope for the future. The posts set forth that Faulk is no great shakes, and certainly not worth trading Saad for. Agree. More important, let’s all keep in mind Q and his picky/prickly/negative energy history w/ the majority of established D-men brought in. He caught lightning in a bottle w/ Roszival for the strike season, and Oduya (part I) worked out w/ Hjalmersson. Other than that, Q’s track record suggest he would not treat Faulk very nicely. Oh, and it looks like Faulk has nice hair, Q may have Kempny flashbacks as well. How about the Hawks making a move for Carolina’s number 2 pick? They could pick up a high end prospect that they desperately need. I would prefer to keep Saad as I believe he will have a strong bounce back year but would consider moving him in a Hannifin deal only. Please let’s not chase after Faulk. Watching the Caps was interesting as their d-corp were not world beaters but the contribution of the forwards to team defense was outstanding, an area where the Hawks have big room for improvement. Regarding the #8 pick I have seen some of the prospects we are considering described as “needs to improve skating.” In today’s game being a plus skater is a requirement for top talent and unfortunately is a skill that is pretty hard to improve significantly. If Saad is involved in a trade. Then we can sign Panarin as a ufa. Have plenty of space and then some. I would rather have Saad and Pararin/Taraves. I am for the Hanafin as well. Deep breath, its in the hair. I would keep Saad. Plenty of talented players have had awful years and have bounced back. Look at Kopitar and Giroux, perfect examples. As for the #27 pick, I’d easily use it in a trade. The talent in this years draft basically drops off after picks #10 or #11. They need established players atm, plus Q doesn’t always play well with developing talent. Just my opinion. Darling is costly for a #2 (which he will be if Crawford returns to form). Faulk is not very good defensively, and his scoring dropped last season. Saad is young – maybe it was just one off year? No deal. I absolutely wouldn’t move the 8th pick unless upward. Since they’ve traded several picks the last few years, and this is supposed to be a deep draft, I would demand something good for a trade to include pick 27. Will the Blackhawks resign UFA Kempy?? I wouldn’t mind seeing Wingels back. Friedman was suggesting Hossa for Darling with the Canes retaining salary – if they retained half then you have a very good back up in CHI for $2 mil ish. What Dickie Dunn said, and Wrap about Darls at 50% retained. Remember CAR knows they got a deal with Bicks trade and can see good relations from that. Faulk had an off year last season but no reason to think at 26 he can’t bounce back. He has shown he can score 15 goals a season and last years drop seemed due to an abnormally low shooting %, which seems to indicate that would likely improve. He is an a very good skater and puck mover, although his decisions at times ciuld be better. The +/- not a meaningful guide as Hanifan and the rest of the team are struggling with that too. What impresses me is while playing for Canes, against other teams top lines is his giveaway/ takeaway ratio where he has consistently had more takeaways than giveaways, rare for a top dman. His corsi numbers also look very good too. Most of the consideration is being put into the how to prop up the old core-(and only one player of that core is playing at or near elite level). Add talent/salary etc. at a huge risk as it needs to work or the mess of cap woes continues for another 8 years. It’s like feeding the aging lion. Taveres, Carlson isn’t happening so the next idea is to add the B level players to what? A team ready to win? Honest thinking? The different thought would be to keep drafting, developing and enriching the young core-but even that is challenging due to guys that have heavy money thru 23/24. The rest of the hockey world knows the Hawks are in that between purgatory. The best trade chip is the one no one wants to consider. and in a couple of years he will be almost untradeable. Still, I think keep getting smart, talented, quick players and hope you catch some magic with your youth. Walstrom or Dobson a good add. Either way it will be interesting what direction the Hawk brass go. There are no easy solutions. Look at the teams that have won, since we did. They had older/similiar cores and had a couple good young players emerge/that 92 guy. 8 could be that guy for us. WAS was not nearly as deep as the yrs before this yr, ya PIYT got extremely lucky winning when getting dominated by WAS and NAS. Those teams rosters had that 2 good centers and that top pair/or 4 Dman. So why cant we do the same retool to that. San Jose had done pretty good/close with similar older core and younger guys hit their prime then they were there again. Not seeing a team full of younger players win, do good, not win. TB should have two yr ago, havnt won nothing yet. Maybe that mix like the teams that have won recently is the right kind of mix? Not trying to disagree, think of what these other teams have won with and what we donot have they had. 81/4. The Chicago trade mentality has always confused/eluded me. Panarin for Saad? As for the rest of what’s being discussed here I remain mute. Salaries and cap hits being as important as they are I am still in awe of the gigantic contracts given 88 & 19. Is Crawford actually gonna play? The “backup” they’re looking for may very well be the starting goalie next season. I’m with Noonan on draft and development, that’s what this league is about. Youth and speed. Guys like Faulk are quickly getting left behind. Draft picks like Schmaltz, Debrincat and to some extent Hinostroza are the future of this team and league. For the first time in awhile the Hawks are not as cash strapped as in past offseason. No reason to give away first round picks. Get two really good players on night one next Friday, then move around the board on Saturday by using the picks in rounds 3 through 7 adding sweeteners like Forsling, Ruuta. Then plug holes through free agency a week later. I am surprised at how many think that the Hawks will be Stanley Cup contenders next year. I agree with Noonan’s assertion we need to build up the youth and young talent in the organization. That needs to have the highest priority. When there is an opportunity to move one of the large contracts for assets or picks, take it. The reality is that we went from a first round exits vs St Louis, to being swept by Nashville, to not sniffing the playoffs. You add veteran pieces to teams that are close and need to get over the hump. Our hump is Mt. Kilimanjaro. If you argue we like Pittsburg have four core pieces to build around, the counter to that is none of our four core pieces other than Kane is producing anywhere near what Pitt’s core is producing. And they got bounced in the 2nd round. Did anyone watch the games we played against Las Vegas this season? They were LIGHT YEARS ahead of us. And with another year on our older players, that gap is only going to get worse, until we have a large enough foundation of youth that is improving to overcome that. Dcat and Schmaltz are really the only two players in that category and that is not enough. They can paint this offseason any way they want, but they better pursue young talent with every move they make, or they are making a huge mistake. I was thinking about it yesterday after Tab’s comment about the Hawks trading their 2018 1st round picks. I’d say the Hawks are at least 2 defensemen and 2 top 6 forwards from being a contender. That’s assuming Crow is healthy too. I don’t think trading 1st round picks is a wise move. re: SSHM’s last comment – 2 top 6 forwards? disagree. Sikura an unknown. And I like the foundations the Hawks have in place for an improved bottom six with more size. If the Hawks are indeed players for Tavares, the question is whether or not the Hawks would keep Schmaltz at center if they added Tavares… because a) I would assume Anisimov is gone to make financial room, but B) Kampf, Edjsell both look like capable bottom 6 centers. As does Luke Johnson. I’d say we are pretty close to agreement. I assume that you feel Toews is capable of being a top center and I do not. I also don’t feel like Schmaltz can hack it as C1 on a cup contender either. Without a stud center forget it. So the fantasy land off season is trade Saad, for Faulk, Sign Tavares, move Schmaltz to wing, sign Ian Cole, sign Tom Wilson as an RFA maybe if I squint hard to see a cup contender. Oh and yank that C off JT19 and give it to JT91 just to motivate him for the Org needing to spend more money on a spot JT19 is getting paid for. to SSHM & Wall – if we’re basing lines on offensive production, a Kane-Schmaltz-DeBrincat line would be #1. But Toews will always be listed at 1C and, with a better season from Saad and consistent other wing, he’s absolutely still a viable offensive player worthy of being in the top six (he scored 20 goals without consistent scoring from the wings playing on his line last year). re: 3rd & 4th centers – “Edge” has a big frame and produced extremely well in the AHL playoffs. I think betting on he & Kampf being your bottom two centers on Opening Night is safe money at this time. Obviously a lot can – and likely will – change between now and September. Anisimov is still here, and a line of AA-Edge-Hayden has a lot of size (something many folks here forget is a reality in this organization). Finally, the idiocy about “yanking the C off 19” needs to stop. It’s ludicious and irrational. If Taveres not available what does anybody think of Stasny uf he were on the market. Solid no.2 center and probably sign a shorter term deal too. Faulk could be the partner Keith needs to have a rebound year as top pair and Cole or Hamhuis with Murphy for a dzone pair. Seabrook and Gus for o zone draws. Wall Johnson is a slow skater but if be plays a gritty type of checking game may not be as big issue, he is supposed to be strong on faceoffs and can score a bit. Sikura, Kahun, Hayden and maybe Hino if still around round to out lines. All indications are Crawford good to go and hear from him next month, so have to go with that. Meant to say Ejdsell as bottom 6 center wuth Kampf is likeky. Talking about no.1 lines and some people suggesting Toews may fare better in more of a winger role, have Schmaltz center a line with him and Kane on wings and Toews could nullify faceoff issues that Schmaltz struggles with. I admit I don’t know Faulk’s game very well but him for Saad seems too high a price although I don’t mind the idea of adding Faulk (merely based on what I’ve read) some other way. re: the talk about adding a center – to be clear, center is actually a position at which the Hawks have relatively good depth right now imo. Toews, Schmaltz, Anisimov, Edjsell/Kampf/Hinostroza/Johnson is a pretty good group. If the Hawks want to go BIG and throw money at a game-changer like John Tavares, it’s to be a game-changer. Adding just a guy like Stastny doesn’t do anything for me. I’d rather have Schmaltz at 2C continue developing/producing. I just read where the Hawks say the pick at #8 is available for the right trade. If they do that it better be something great because that pick could be a player that’s great for a long time re: Savard and Roenick. Sorry about Savard not a number 8. Columbus got Zach Wereinski at 8. I hope no.8 pick doesn’t go anywhere. Tab agree on the game changer statement but if you move AA and use up your cap space. Then you have Schmaltz probably 6m range with Sikura, Kampf and Ejdsell all to resign in a year and already 4.8m of the 6m allowable bonuses on the table as possible carrying over, likely 2.8m at least be earned, how do you make room. Wall, I like every post you have on draft players and prospects. Not many know that info about each prospect. Very valuable information. 91, come on down, your the next contestant on the price is right. Sounds like the conscientious here is draft with everything (including trading players we have to get more) we got and get Tavares (and maybe a Dman). If we do need 4 players to be contender, 1 from draft/2 from ufa/I at deadline. Did no one watch Scott Darling this past season? Is he really an upgrade to the mediocre backups the Hawks already have? Night and day with NHL goalie, let alone the Crow (top 5). Showed our weaknesses for us to fix or fill with guys we already have when ready. 8th pick to trade for 4or5th if certain player available and more in the trade MTL/OTT. Wheres Shalunov at with his contract. It’s hard to imagine a team with more opportunity then this Hawks team. Odd request. Nalimov must really fear competition if he’s afraid of those other goalies. With Crawford if he wins the backup spot he’d probably get anywhere from 20 to 25 games. I doubt he would come over and become a starter with any team. If he doesn’t want to be a Hawk then grant his wish. Luke Johnson is going to be a solid NHL hockey player. He has improved every single year since his days with the Lincoln Star and truly has passed some of his North Dakota teammates in the pros. Skating will not be an issue because he goes in straight lines and leans on his stick at the top of the crease. One other thought. With Rick Dudley now running the operations in Carolina, keep an eye on Anisimov. Dudley LOVES big centers. I doubt that has changed. Any deal with Carolina might include him. I think if there is any doubts Crawford will be healthy, that securing his backup now and uee ltir during season and acquire a starter with that room will be how its handled. Maybe the talk of reacquiring Darling has Nalimov who said doesn’t want AHL time but wants to play here a bit discouraged or it made his agent call Bowmans bluff and ask for a trade. Reaquiring Darling and Canes retaining half or so salary is hoping he can be the backup he was a couple of years ago and not the starter he was last year. We cant ever win again, core is washed up, were too many yrs away etc. What is the most ideal moves to be top 5 again/contender. If Bowmans gets Faulk, with Seabrook and Rutta under contract, there is a real possibilty that Murphys 3.85m cap hit will be moved. Especially if they are thinking Jokiharju could be on the roster and will have rightside defence personal they want next season. Wouldn’t you think Rutta would be not Murph. Can always move 5 later. People seem to like 5 better (as a Dman). Be cool if Rutta has shook off those two late hits to the head, with no penaltys. I am not one to get into conspiracy theories but it sure is strange how little we have heard about Crow. No one ever provided much substance during the year and even now we are still kept wondering what the heck is going on. Don’t disagree about moving Rutta over Murphy. Just as said Murphys cap hit is higher and a committment to Faulk with Ruttas contract coming off books at end of year may work to their thinking, with Jokiharju and Mitchell coming along. Probably going to need 10 m in cap space next season just to take care of in house business too. Its almost weird that it is that quiet about it. I like keep better player, with as much as 17.5m not counting AA possible theres just no reason caphit wise, unless we are adding Tavares. Then maybe every penny counts. He got a little too close with Jack Daniels….. I wish him well & hope he can overcome his demons for himself, not for the Hawks. I have heard from a pretty reliable source that Crows “issues” have little to do with anything thats on ice related. That being said he is slated to attend the fan convention so you can assume he is healthy. The bigger question is can he remain healthy once he is around his teammates. I’ll just leave it at that. If the Hawks pull the trigger on a goaltender like Scott Darling, or someone with a reasonable contract it’s safe to assume whatever Crow is dealing with is not cured. With only 2 years remaining on his deal the Hawks should be looking for some long term answers in net anyways. SSHM i would think if they thought Crawford wasn’t going to play they would be doing all they could to get Nalimov here and take one the goalies spots, not seemingly discouraging him. By talking about Darling and it causing Nalimov to want a trade, that tells me Crawford is expected to be in goal to start the season. Joey i doubt very much they would have been testing him on the ice during the season if what your saying was credible at all. I really hope I’m mistaken, for crow’s sake. Most likely it’s a combination of things. Looking back at my comment it was flippant & insensitive, I apologize for that. This is no laughing matter, and I hope he is getting the best treatment available for whatever the issues are. Thanks for the additional info guys. I am also at a complete loss to understand this trade request by Nalimov. The Hawks badly need a solid back-up who potentially could play a lot of games depending on Crow’s health. What the hell more could you want for a guy who has never played in the NHL. Almost sounds like there was negotiations with Nalimov if he terminated his KHL contract. His agent has said he wanted time there to be his minor league development time. So he could want a some guarantees thay he stays on NHL roster that Bowman won’t give into. Since no agreement with KHL, if he signs with Blackhawks he is not eligible to be loaned to a team in that league so not sure if he’d want a European clause to be an issue or not. Not that’s is a good thing, its drinking etc kind of thing that’s better then concussion of the unknown. Be tuff not to party, as much you want/when you do, with team and at times to stay sane. Play hockey and play it good like he is. Then he be fine. He had to wait for a 12wk mandatory class or something, no point with team record and deep draft. Heal baby heal. Love the way they say recommend, when they really are saying through their grinning teeth, because you have to do what we tell you know matter what or 12wks starts over. Recommend or required, tell it how it is. I drank beer after we were down 3-1 to DET, when I was doing 12wk class/before it was over. Taking a chance on getting caught. We know how that turned out. If i’m Bowman i would be looking at Sens right now, if Karlsson too high Hoffman would make a nice top 6 forward. Yes, Ian, we’re coming to find out that Hoffman is romantically linked to a psychopath – exactly what the Blackhawks need to get back into Cup consideration. There are probably 30 teams right now that don’t know what to do with the Hoffman situation. If that proves to be true agree, but why was the restraining order denied against her in court.